The X Report of the Observatory Cardinal Van Thuân dedicated to political Islam (see here) “opens a new avenue” and delves into the reality of political Islam, while at the same time analyzing its “compatibility or incompatibility with the principles of the Social Doctrine of the Church”. These are the words of Most Rev. Giampaolo Crepaldi in light of the limited degree of attention devoted to the impact of Islam in Europe by the mass media and the political and cultural world. In this regard, two alone seem to be the concerns of Europeans in Msgr. Crepaldi’s mind. As far as political institutions are concerned, it is thought that the way to deal with any and all problems entails respect for the “principle of tolerance” alone. Regarding the Catholic Church, its only concern rotates around the urgent need to initiate “interreligious dialogue”. Both ambits – civic and religious – seem to base any future endeavors regarding Muslim immigrants or citizens on the “principle of religious freedom”. Gauging everything on religious freedom, however, “does not suffice”, Archbishop Crepaldi argues, “because left out of the picture in this way” is the issue of the truth of religions, and that of the very particular features of Islam. Precisely due to the theological nature of Islam, for example, it cannot be a matter of mere tolerance alone as far as Islam is concerned since there can be nothing in exchange, and this to the degree that “a certain fundamentalism is inseparable” from the religion of Muhammed. Msgr. Crepaldi also feels that lobbying by the new political parties of Islamic matrix for the inclusion of elements of Islamic right (fiqh) and Islamic law (charia) in European legislation is in no way to be underestimated. In addition to this aspect of political Islam, there are also other features: separation between Church and state is extraneous to Islam, the social system is based on submission to the God of the Qu’ran, and the unity and superiority of the Islamic community (Umma), without even delving into very particular convictions about women and the family so far removed from the western outlook. Therefore, the Social Doctrine of the Church and Islam have very different positions, but not only that: the social doctrine has a very different vision also compared with neo-illuminist modernism, which is the basis for practically all the liberal institutions in Europe. This overall picture therefore projects all the weakness of the European system with respect to an aggressive Islam, not so much insofar as armed attacks are concerned – perpetrated by a minority –, but at least in cultural terms since Muslims are ready to become integrated in their own way, striving to export their religious principles into politics and society. This is the reason why Giulio Meotti writes about an evident social hegemony programme being implemented by Muslims in France. And, to this end, he quotes the Archbishop of Strasbourg, Most Rev. Luc Ravel, who argues that underway is a “Great Replacement” regarding the low birth rate of the French compared with that of Muslims. In brief, Meotti states that underway is the “peaceful Islamization of Europe to be brought about through mosques, proselytism, demography, multiculturalism, and replacement”. This had already come to the surface back in 1990 when the Islamicist Bernard Lewis said that “politically correct language and multiculturalism were a lethal blend for the west”, and announced “the third Islamic invasion of Europe, which would have been more successful that the first and the second one”. No matter how things may stand, it is a fact, as Meotti remarks, “that there were around 100 mosques in France back in 1970, and now there are more than 2,450, with approximately two new mosques opened ever week over the last ten years”. Stefano Fontana considers that the current situation is rendered unstable by two opposing forces that are entirely asymmetrical. On one hand there is the “accommodating Europe with practically no demands”, and on the other hand a “convinced and resolute Islamic community”. Hence, a lack of equilibrium. Western weakness, remarks Mr. Fontana, is also due to the fact that Europe “refuses to know Islam”. In even clearer terms, “Europe recognizes Islam in the sense of accepting and certifying it, but without knowing it for what it is”. Silence enwraps any and all issues: polygamy, the parallel right of the charia, the condition of women in Islam. There is nothing but a vague and widespread dream about the possibility of there being a European- style “moderate Islam”. Nonetheless, as Mr. Fontana writes, “neither in the Qu’ran nor in the sayings and writings of Muhammed” is there any place for such an Islam. Hence, emerging is an absurd approach: “integration” is what the west calls imposing upon Muslims “an inconsistency with respect to the principles of their religion”. Everything is based on some misunderstandings. According to western mainstream thinking, the issue of migration will be solved by the principle of religious freedom, tolerance, and the conviction that all the monotheistic religions are fundamentally equal. As Mr. Fontana explains, not even the Church is extraneous to this rationale when it fails to venture beyond the proposal for interreligious dialogue and the multicultural society. Reality is quite a different matter: “The west cannot integrate Islam insofar as it is disintegrated in its own right, and because it doesn’t want to look directly at Islam for what it is”. 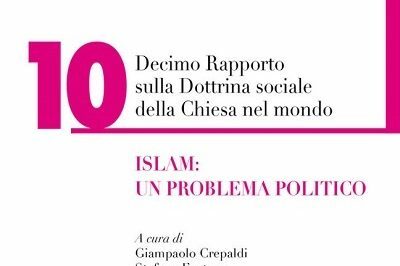 G.Crepaldi, “L’Islam politico e il nuovo compito della Dottrina sociale della Chiesa”, Presentazione del Decimo Rapporto sulla Dottrina sociale della Chiesa nel Mondo,Islam: un problema politico, Cantagalli, 2018. pgs. 9-20. Msgr. Crepaldi is the President of the Observatory Cardinal Van Thuân on the Social Doctrine of the Church, Archbishop of Trieste, and chairman of tCECE (Council of the Eposcopal Conferences of Europe). G.Meotti, “Demografia e proselitismo: l’islamizzazione “pacifica” dell’Europa”, Il Problema dell’anno, in Decimo Rapporto, op cit. pgs. 187-195. Meotti is a journalist and a writer. L’archeveque de Strasbourg evoque “le Grand Remplacement”, ValeursActuelles, 3 July 2017. Nota di Meotti. 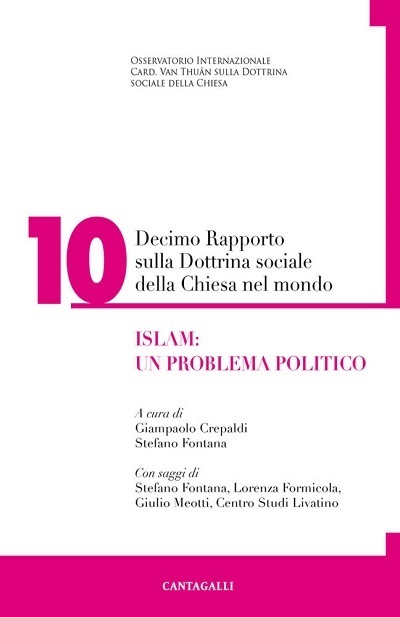 S. Fontana, “Islam: un problema politico”, Sintesi introduttiva del Decimo Rapporto, op cit. pgs. 15-20. Mr. Fontana is the director of the Observatory Cardinal van Thuân on the Social Doctrine of the Church, Trieste (Italy).